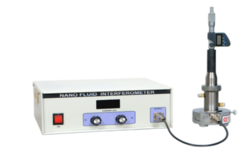 Providing you the best range of diode laser kit, holography interferometry kit, laser kit, constant deviation spectrometer, particle size measurement kit and jamin interferometer with effective & timely delivery. he kit has been designed to perform a lot of experiment related to the light experiments to find out the wavelength of the light, width of the narrow slit or any type of pattern. Exp-1 To demonstrate Young’s fringes. Exp-2 To demonstrate diffraction pattern by pinhole, single slit, double slit & grating. Exp-3 To demonstrate Fresnel’s diffraction. Exp-4 To determine the slit or pinhole width. Exp-5 Light spreads when passed through a narrow aperture. The holography and interferometer kit is developed for general physics education in universities and colleges. It provides a complete set of optical and mechanical components as well as light sources. Through selecting and assembling corresponding components into complete setups, student's experimental skills and problem solving ability can be greatly enhanced. The instruction manual contains comprehensive materials including experimental setups, principles, procedures and required parts with photos. In the present setup, allows students to perform five experiments which enable them to experimentally investigate and acquire practical familiarity with the fundamentals and application of holography and interferometry. Include experiment setups, principles and procedures. Exp-1 To find out the focal length of convex & concave lens. Exp-2 To find out the focal length of concave & convex mirror. Exp-3 Image formation by plane mirror. Exp-4 Real & virtual images formed by lens & mirror. Base:Heavy stable base having a pillar on which mounted a platformcollimator/telescope prism housing. Prism table:Carrying prism pillion and broca type refractive indes 1. 65/1. 74 housed properly with a cover rotatable by wavelength drum, outside. Telescope:Fitted on the platform, focussed by rack/pinion, achromatic objective with light resolution, eyepiece with a scale last count 0. 01 cms. Collimator:With achromatic objective having high resolution operateable by rack & pinion, having slit variable opening by micrometer screw. 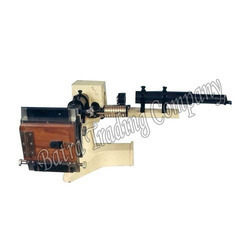 Glass prism e. D. F.
Glass prism d. E. D. F.
a) Attachment for converting c. D. S. Into monochromator. 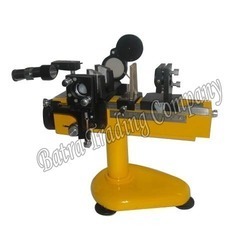 b) Micrometer eyepiece – filer type reading 0. 001 cms. c) Camera for above with plate holder. d) Plate holder for camera. a) Standard accessory bar- nearly 3 feet long. b) Fabry perot etalon-aperture 30mm etalon with separation 3mm, 5mm, 10mm as desired by customer. c) Edser butler plate for determining wavelength. He-Ne laser beam through a plate dusted with lycopodium powder to construct circular rings on the screen which are nearly spherical and have a very uniform average diameter. The quality of the ring depends on the evenness of dusting. We are a leading manufacturer and supplier of Jamin Interferometer. Jamin interferometer is designed with two stylish mirrors, made of the thickest glass possible. While allowing very exact measurements of the refractive index and dispersion of gases, jamin interferometer also consists of a transparent pressure chamber, facilitating easy measurement of even the slightest phase shift due to changes in pressure. Plane-Parallel optical glass cell with mechanical mounts. A pair of gas cell with plane-parallel widows with mechanical mount. Telescope to observe the fringes. Keeping in mind the diverse requirements of clients, we are offering a premium quality range of Michelson Interferometer. 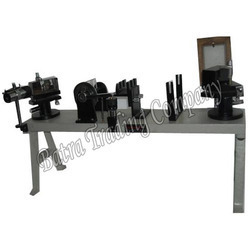 The offered interferometer is manufactured under the stern guidance of our deft engineers making use of high quality components and contemporary technology. Low maintenance costOffice of the Principal, Government women’s polytechnic college, Shivaji Nagar, Bhopal, M.P. No./GWPBPL/NIT/ ET/2018-19/02 Date: 17-Apr-18 e- Tender notice (NIT) Online bids (Two bid system) are invited for supply and installation of various lab and other equipments from reputed manufacturers or authorized dealers/resellers having relevant experience and fulfilling the desired terms and conditions. Last date of bid submission is 08 May 2018, as per the schedule and further details described in detailed tender document available at institute website – www.gwpbpl.org and www.mpeproc.gov.in. All bids will be opened as per the standard procedure of eTendering system. All corrigendum/ amendments/changes, if any will only be issued and made available at www.mpeproc.gov.in. We are a unique name in the industry to provide our precious clients an exclusive range of Diode Characteristics Apts. Offered apparatus is exclusively manufactured using the optimum grade raw material and modern technology in synchronization with the set industry standards. 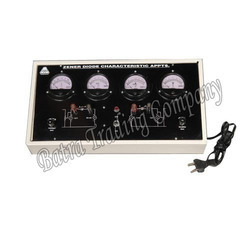 Owing to its specific usage in various physics science lab, this apparatus is very popular among our clients. 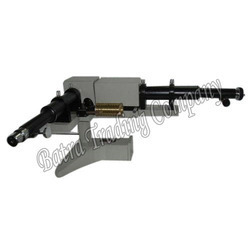 Furthermore, to ensure the best quality, the provided apparatus is tested by our quality experts. Characterization of Nanofluids like Ag/Au & Ferrofluids etc. significant enhancement of its property. Looking for Physics Research & Laser ?